These cookies are simply addicting. Do not underestimate these little gems! They are soft, chewy, and full of the flavors of the season: Oatmeal, cinnamon, cranberries, white chocolate chips, and nut, will make this the cookie of the season. In fact I love them for breakfast! I love these cookies so much , that I make a batch or two of dough in November, form the cookie dough into the balls and flash freeze them on a pan (slightly flattening them like in the directions) until they are frozen and then packaging the frozen cookies in a freezer bag. Then I can just reach in and pull out however many I need / want to bake at a time, place on a pan to thaw for 15- 20 minutes till thawed and bake according to recipe directions. Makes for easy baking during the holidays when you need to bring treats at a moments notice. 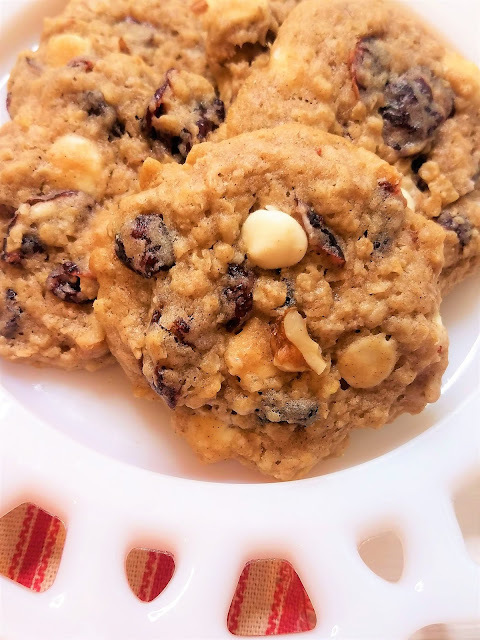 I love to pair these cookies in a gift basket with my Double Chocolate Cranberry Almond Bark. They make a great combo that is fun, festive, and tasty! Let's Get Baking these sweet treats! 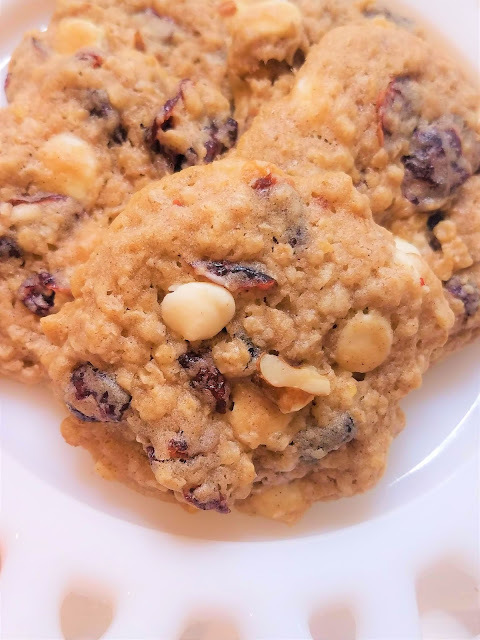 Soft, chewy, and full of the flavors of the season: Oatmeal, cinnamon, white chocolate chips, cranberries, and nuts, will make this the cookie of the season. In a medium bowl, whisk together dry ingredients: flour, baking soda, salt, cinnamon and nutmeg. Add oats and stir to combine.
. Add dry ingredients mixture a little at a time just until combined. Stir in cranberries and walnuts and optional white chocolate chips. Roll dough into small balls or use Cookie scoop and place onto a parchment lined cookie sheet , silicone lined pan, or spray non stick spray on a cookie sheet and place about 2″ apart. Press cookies down slightly to flattten. Bake cookies 7 minutes, rotate pan and bake an additional 7 minutes, or just until set. Remove cookies from oven, even if cookies are slightly soft in center. They will continue to bake after being removed from the oven, while cooling on the pan. (and thus not over browning the bottoms and edges. allow to cool approximately 2-5 minutes before transferring to a cooling rack. These look chewy and full of flavor! I could see them being great cookies for the fall too! You had me at oatmeal. I love that you added cranberries to it. Great tip about the flour- I get lazy about it, but it does make a difference! These look great for all year, not just Christmas! Lots of goodness going on in these cookies!